James Neiss/staff photographerNiagara Falls, NY - Members of Nik Wallenda's engineering team, on the ground from left are, Dan Hill, journeyman lineman, Randy Fletcher, general foremen, Justin DeSantis, lineman, and Dennis Morgan, general foreman, install a shoulder block to support the cable and a yoke plate to distribute the line tension on Goat Island at Niagara Falls State Park. Crews started about 10a.m. 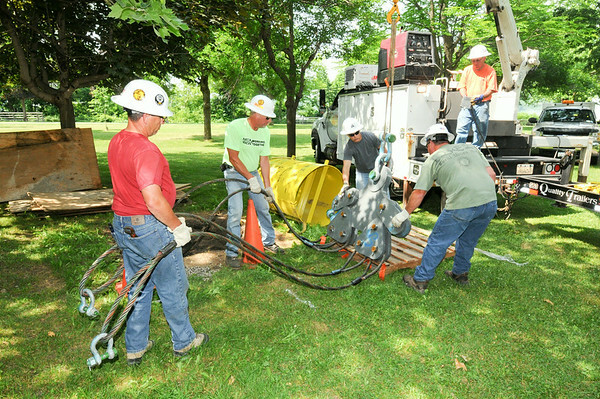 on Monday setting up Wallenda's wire for his walk across the Niagara Gorge on June 15.